PCH is located on Hospital Avenue in Nedlands, just six kilometres from Perth City on the QEII Medical Centre (QEIIMC) site, which also includes Sir Charles Gairdner Hospital (external link). PCH is bordered by Winthrop Avenue and Monash Avenue. We are across the road from Kings Park and only a few minutes away from the University of Western Australia. There are frequent buses to the hospital with several bus stops along Hospital Avenue and Monash Avenue. The closest train station to PCH is Shenton Park, on the Fremantle line. At Shenton Park Station, catch the 999 bus to the Hospital Avenue QEII Medical Centre stop. 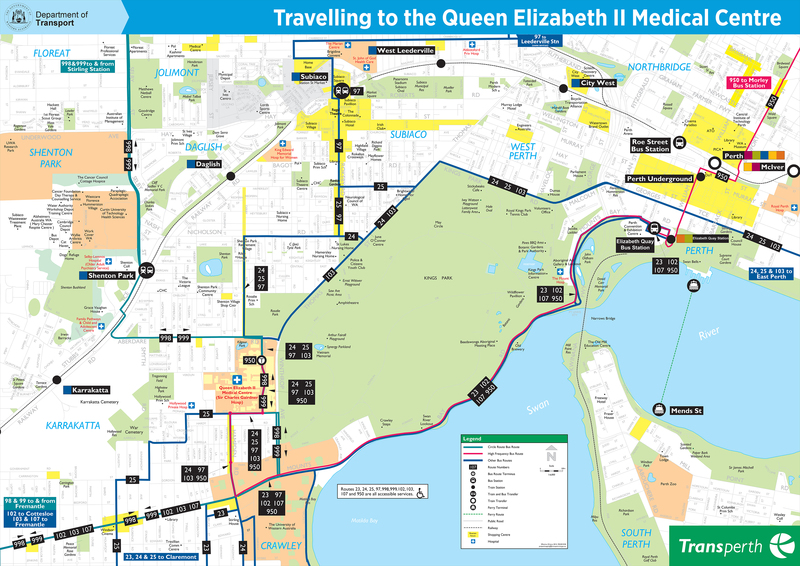 Alternatively, hop off the train at Elizabeth Quay Station and catch the 950, 103 or 24 bus to the Hospital Avenue QEII Medical Centre stop. PCH is bordered by Winthrop Avenue, Aberdare Road and Monash Avenue in Nedlands. There is a drop off area outside the main entrance with 15-minute free parking and 30-minute free parking for ACROD permit holders. Paid parking spaces are available in the hospital’s basement car park and the QEIIMC multi-deck car park. If you wish to walk or cycle to PCH, there are many pathways and cycle routes (external link) you can use and we provide bicycle racks close to the hospital’s main entry. View the PCH map to locate the main entrance and the QEIIMC site map to locate more bicycle parking points on site. There is a taxi rank outside Sir Charles Gairdner Hospital (E Block) on Hospital Avenue. Taxi phones are located at this rank. View the PCH map to locate the taxi rank. If you are travelling to PCH from more than 100km outside the metropolitan area, you may be able to get a refund for part of your travel and accommodation expenses under the Patient Assisted Travel Scheme (PATS) (external site).